Foie gras continues to spark outrage from all sides. Michael Mansfield, known for defending some of the biggest cases in British legal history, has sprung to the defence of geese today by calling for Fortnum & Mason to rid its shelves of cruelly produced foie gras. Force-feeding of birds for foie gras production, which is already banned in the UK, is allowed in just five European countries – including France – which is why Fortnum & Mason shamefully pays French farmers to force-feed geese on its behalf. During foie gras production, huge amounts of grain are pumped into the stomachs of ducks and geese through metal pipes, which are rammed down their throats several times a day. Their distended livers – which can swell to up to 10 times their normal size – press against their lungs, causing them to pant constantly. 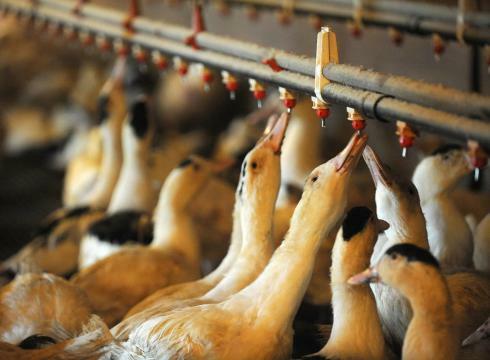 Veterinarians and avian experts agree – there is no humane way to produce foie gras. This entry was posted in Geese, News and tagged Foie gras, Force-feeding, Fortnum & Mason, France, Huffington Post, Mason, Michael Mansfield, Piccadilly on June 11, 2013 by naturalpfg.